Tobias Zimmergren (Microsoft MVP) and Jussi Roine (Microsoft Regional Director and MVP), are teaming up to discuss and break down various scenarios and how to get started on your own journey into container-land. This post is about hosting a public .NET Core C# API inside of a container (ACI), whose image is pulled from a private container registry (ACR) - and enable secure transfer with HTTPS using Application Gateway. Learn how to build a C# API that is suitable for container deployment. Azure subscription with resources included for securing and hosting .NET Core API in Azure Container Instances, with Azure Application Gateway. Let's dive into how Azure Container Instances, Azure Container Registry and C# API's can play together. Then we'll tie all this together by publishing our container from ACI using Application Gateway. The following utilities are good to have in your arsenal if you're going to tag along with this post. Docker should exist on your machine. As we'll be developing our custom API that runs within a Docker container, it makes sense to have Docker available locally. This allows us to perform troubleshooting, debugging and the classic F5 build and deploy pipeline working before we even consider deploying anything to Azure. We'll need to download Docker for Windows or macOS depending on our operating system. For the purpose of this post, we're using Docker for Windows (download). It's free but has certain requirements - mainly, the Hyper-V role must be available on your Windows workstation. Generally this is not an issue on Windows 10 but be sure to check your BIOS settings if you run into problems. During the installation Docker asks whether you want to run Linux or Windows based containers. As we aim to built a platform agnostic solution (the API) you should choose the default, Linux based containers. Once Docker for Windows is installed test that it works by opening your favorite command prompt (cmd.exe is more than fine, but cmder is an absolute favorite) and type docker ps to verify everything is running as intended. Tip: If you've got multiple Azure subscriptions and your user account has access to more than one subscription, it's a good idea to ensure that you're targeting the correct account when you execute the commands. The first command will list all subscriptions you can access. The second command sets the target for the CLI, where the <GUID> is the id you want to point to, as you would get with the first command. This creates a resource group in the West Europe region. Obviously you can choose to use any other region that is closest and makes the most sense to you. Before we actually get to create anything we need a place where our private Docker containers will be stored. This is what Azure Container Registry is needed for and it let's us keep our own containers private and not publish them for public consumption. Now that we have the services in Azure we'll initially need, it's time to start developing our API! We'll build a simple API based on the Office 365/Azure AD Tenant ID Lookup API. You can see the GitHub repo here. The API takes a tenant name in the form of tenantname.onmicrosoft.com as parameter, and performs a simple Microsoft Graph query to resolve it's internal ID, which is in GUID form. This is useful as the ID is often needed for configuration throughout Azure and looking it up using a simple API makes this much easier. To build the API, open Visual Studio (we're using VS2017 and VS2019 Preview when we do our projects) and create a new project. Choose Visual C# > Web > ASP.NET Core Web Application. In the following dialog make sure to select Linux Containers (instead of Windows, as Docker is by default configured for Linux) and do NOT select HTTPS. This is important as otherwise our container will run through the ASP.NET Core middleware that makes development a little bit more peculiar (but perhaps slightly more secure -- but for our purposes running over HTTP is fine). In addition we'll be using Application Gateway to enforce HTTPS for our API endpoint. Visual Studio 2019 and the "Create a new ASP.NET Core Web Application" dialog. Make sure to UNSELECT "Configure for HTTPS" and select "Linux" for your docker support. Simple Web API project based on C# .NET Core, alongside it's Dockerfile configuration for running it inside a container. Replace the existing code with this class, and mind the [Route("api/)] attribute on the controller (to avoid the need to hit /api/tenantidlookup/yourTenantName and instead just /api/yourTenantName). It's rather simple, but let's walk through the logic quickly. As we're expecting a parameter for tenantName through HTTP GET, we then instantiate a traditional HttpClient to make our REST call against Microsoft Graph. We then construct the URL for our query and check the response, which is a comprehensive JSON structure. From that structure we simply need to pick up the Authorization Endpoint value, which is the GUID we're after. Should we run into any errors our API simply returns the HTTP status code back (such as HTTP 400 for a bad request or when a tenant name is not found). You can now run the solution with F5 -- a Docker container will be constructed based on Dockerfile in the project. To test the API, open http://localhost:port/api/zimmergren which should resolve to a valid GUID. Tenant Id Lookup API running in .NET Core. While you're running the solution open a command prompt and type docker ps to see your Docker container in action. Notice that even after you stop debugging your solution the container keeps running via Docker locally. As the API works now it's time to push it to Azure! The easiest and visually most meaningful way to publish the containerized API to ACR is to use Visual Studio's Publish wizard. It's trivial and holds your hand through the process. However it is also possible to publish our API using Azure CLI so that's what we'll do next. This is also useful should you need to automate this process in the future. Note You'll need to replace acrdemo2019 with the name you designated for your ACR instance previously. Success - we can see that the repo indeed has our image that we asked for. You could test the container now but as it's literally the same as what we have just tested locally we'll skip testing for now. Our API does not contain anything sensitive at this point, but later on it might evolve into containing something sensitive = we'll provision an instance of the containerized API to our private network. This lets us control the networking around the API a lot better and doesn't expose the API for public consumption by default - although this is possible in numerous ways when needed. Azure Virtual Networks (VNETs) are useful for this, as they allow all sorts of tinkering with network traffic quite easily. This provisions a new VNET using the IP address space of 10.0.0.0/16. From this address space we'll split a subnet of 10.0.0.0/24. This subnet will host our containerized API. Our VNET now holds two subnets - 10.0.0.0/24 for containers and 10.0.1.0/24 for Application Gateway. The reason we need Application Gateway is that it allows us to act as a front for our containerized API. 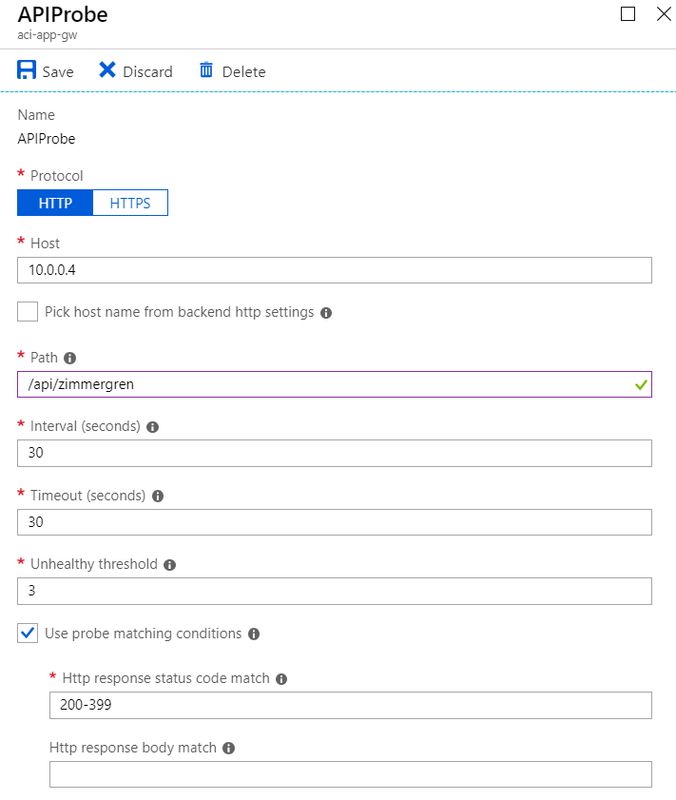 We'll use Application Gateway to expose an endpoint using HTTPS, that in turn connects to our internal VNET using HTTP (as the API supports HTTP). Later on, Application Gateway can be configured further to act as a Web Application Firewall also, allowing for added security and monitoring also. We're also going to need Azure Key Vault in order to authenticate against ACR when provisioning a container to ACI. Azure Key Vault will be responsible for storing our secrets we need during deployment and it can also be leveraged later from our API if needed. ACI currently does not support Managed Identities when using VNETs, thus we'll need to provision a service principal in Azure Key Vault. For this, we'll need to creat a Service Principal. In the future a Managed Identity could be used instead if ACI with VNET-based containers becomes supported. As ACR is responsible for storing and maintaining our Docker containers, ACI is responsible for actually hosting and running our containers. To provision a new ACI in our resource group is trivial. What makes this slightly more challenging is that we'll pull our own container image and for that we need to authenticate. The second thing that slightly changes our approach is that we need to bind the ACI-hosted container in our subnet of 10.0.0.0/24. And we need to bind the ACI-hosted container to our subnet (and our VNET) for added security and for publishing the container over HTTPS with Application Gateway. There's quite a lot happening here. az container create provision a new ACI-hosted container by pulling our Dockerized API image from ACR and binding that to our subnet within our VNET. Last and definitely not least, we'll need to provision the Application Gateway. It's a very capable service and we aim to do the least to get it working for our needs. To make things more secure, we'll leverage the HTTPSto-HTTPS redirection capabilities of Application Gateway. This way, all requests to our public IP (exposed by Applicaton Gateway) over HTTP will be redirected to HTTPS, and then Application Gateway acts as a reverse proxy to channel traffic to our containerized API. You can then make this look nice with your own domain name. To configure the redirection, we'll need a self-signed certificate. Obviously you'd use a real, trusted certificate in a production scenario but to show how things work, it's easier to use a self-signed certificate. There are numerous ways to generate a self-signed certificate. One approach that is fairly easy is to use a tool called OpenSSL. It's not part of Windows installation by default so you'll need Win32 binaries first. You can download them here. As a result you should have aciappgwcert.pfx in the same directory you ran the commands in. Now we can provision Application Gateway, bind it to our VNET and use our own self-signed certificate to secure traffic. This takes a while, as Application Gateway provisions quite a bit of logic in the backend. While mostly everything is in order now, we still need to add something small - a health probe to verify our API is responding. Remember that the API running in the container in ACI is bound to our private VNET and has a private IP address that is non-routable. To test the API, we could spin up a virtual machine in the same VNET and simply call the API, call the API from another container in the same VNET or subnet - or another alternative is to add a health probe in Application Gateway to verify this for us. To add a health probe using Azure Portal, navigate to the Application Gateway blade and select Health probes. Then, go Rules and select rule1, which is the default. 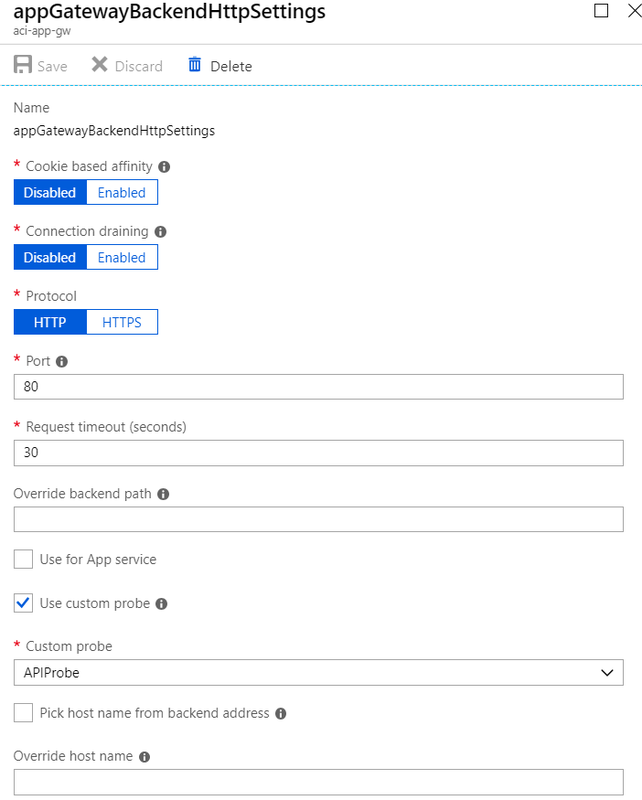 Select appGatewayBackendHttpSettings and from here select Use custom probe - and then just select the Health probe you created. And that is it! You can test out access to your API end-to-end by navigating to https://<app-gw-address>/api/<tenantname>. Application Gateway address is the public IP you provisioned earlier, and <tenantname> can be any valid (or non-valid!) Office 365/Azure AD tenant. This should return a valid GUID, proving that our API works! It's been a blast doing this and walk through the various steps, but not without challenges. If you'd like to see more adventures of Jussi & Tobias in container-land, we'd appreciate a comment here or on Twitter where we both hang out quite a lot.